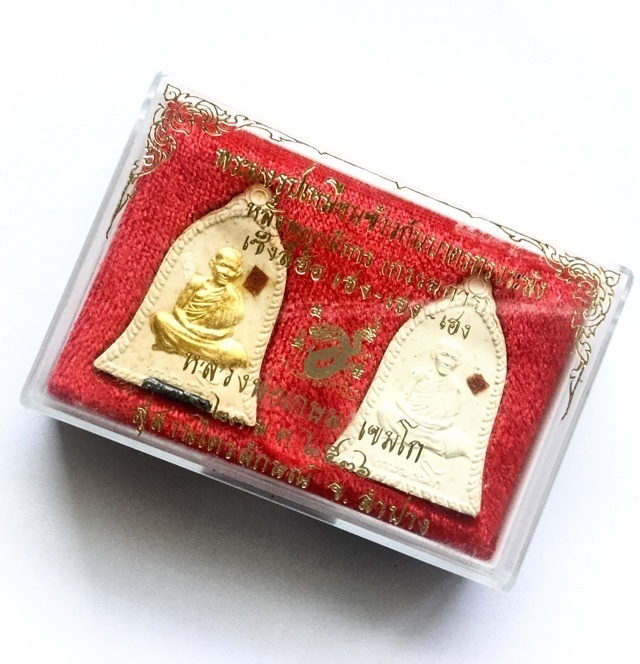 Special Gammagarn set sacred powder amulet from Luang Por Kasem of the Sussaan Trailaks in Lampang. 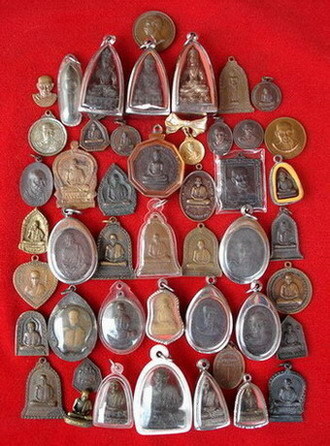 The set is composed of two Bell Shaped (Song Rakang) amulets bearing the image of the Great Arahant Monk Luang Por Kasem Khemago. One amulet has the image of Luang Por Kasem covered with gold leaf, and one Takrut spell inserted into the base, in Herbal Powders. The second amulet is made in Nuea Khaw Gon Badtr Sacred Powders. A piece of Civara robe is attached to each amulet. The amulets come with the original temple box, and are Gammagarn special edition. Released in the Seng Lee Heng-Heng-Heng Edition in 2536 BE. Khaw Gon Badtr is a substance made from the dried rice from the bottom of the almsbowl of Luang Por Kasem, mixed with Puttakun Powders. The amulets were released as a small numbers limited Ongk Kroo version in the Seng Lee Hor Heng-Heng-Heng Edition in 2536 BE, just 3 years before Luang Por Kasem finally passed away and left us for the pure realms. Who indeed would not wish to have these amulets with a Sacred Piece of Civara Robe of the Guru Monk amulet of such a Highly revered monk, considered an Enlightened Arahant?. Above; The Paya Mangorn Imperial Dragon is embossed on the rear face of the amulet, which is surrounded by Chinese Script and Thai Script. The name of the edition "Seng Lee Hor Heng" is written above the Dragon. His Dtamra of amulets is indeed vast in the number of different models and editions, but almost all of them have recieved the attenton and documentation of academics, and been highly authenticated and easily valued because of their ease of study, due to sufficient documentation, making his amulets highly preferred by serious collectors. Tan Khemago Bhikkhu (Luang Phu Kasem, or, Luang Por Kasem, Khemago), is an extremely revered monk of the Lanna tradition who the is considered one of the greatest Ajarn of modern Thai history, and has a massive and devoted following in the North of Thailand (and indeed all over the country). His devotees believe that to pay reverence to him or wear his amulets, results in receiving protection and safety wherever they go. 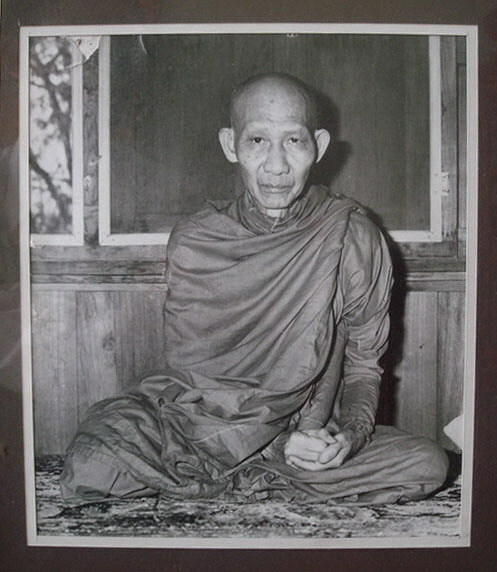 His amazing dedication to his practice and purity is common knowledge with Thai people, which is easy to see since the very beginning of his path as he gave up the title of abbot of the temple. 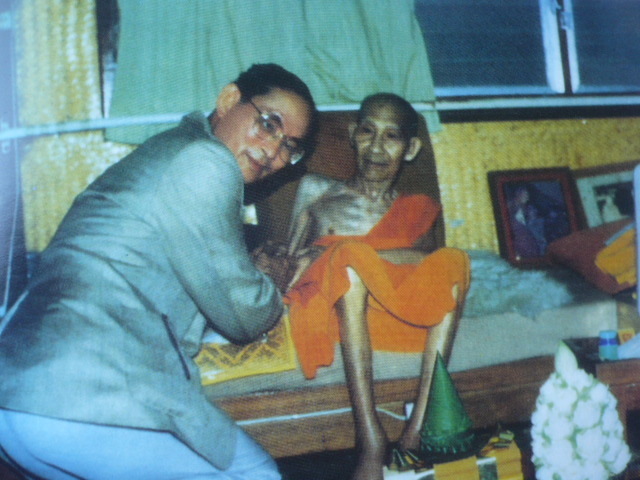 He renounced Abbothood, and went to practice Vipassana Kammathana forest tradition methods residing in an old cemetery in the forest on a mountain side, which is where he remained practicing in humility and simplicity to the end of his mortal days.